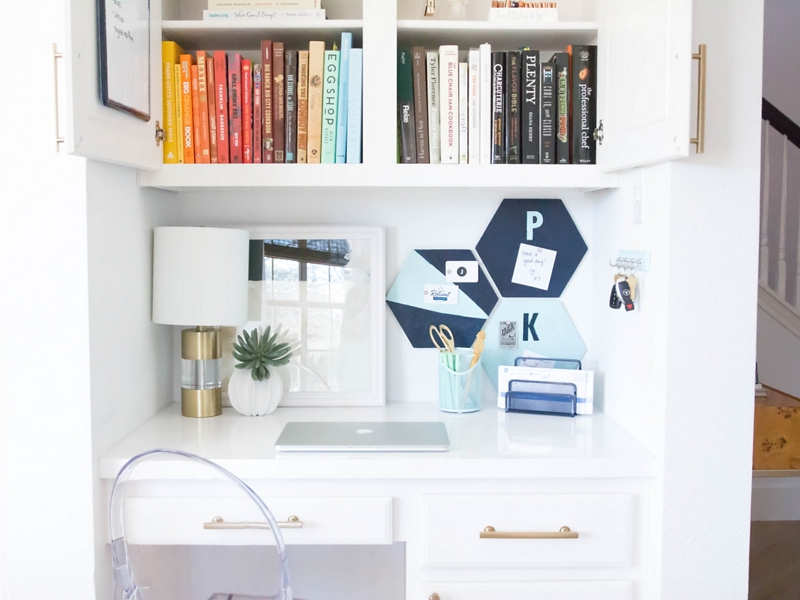 Stay organized with a kitchen command center created with cool and metallic Krylon shades! Before starting, read the Krylon® labels for safety and application instructions. To start the project, paint the cork tiles. Paint one tile using Krylon® ColorMaster® Paint + Primer in Gloss Navy Blue. Paint the other two tiles using Krylon® ColorMaster® Paint + Primer in Matte Aqua. Because cork is extremely porous, apply three coats on each tile and then let them dry to touch. Once the tiles are dry to the touch, add alphabet stickers to create personalized accent designs. You can also use painter’s tape to make a triangle design. Once the alphabet stickers and painter’s tape are adhered to the cork tiles, spray paint them with the opposite Krylon® blue shade that you initially used to spray the tiles. Once the tiles were dry to the touch again, removed the letters and the tape to reveal the design. Next, refresh old metal desk supplies with Krylon® ColorMaster® Paint + Primer. For the pictured look, paint a pen holder in Krylon® ColorMaster® Paint + Primer in Matte Aqua and paint a mail sorter in Krylon® ColorMaster® Paint + Primer in Gloss Navy Blue. Use 1 coat for the pictured look. To create a space for a to-do or grocery list, tape off the dry-erase section of an existing dry-erase board (or create your own with Krylon® Dry Erase Paint), leaving only the frame exposed. Paint the frame Krylon® ColorMaster® Paint + Primer in Gloss Navy Blue. Once the paint is fully dry, add some metallic detail using Krylon® Leafing Pen in Silver. Lastly, spray paint a key hook rail to keep track of your keys. Remove the hooks from the rail and painted it with one coat of Krylon® ColorMaster® Paint + Primer in Matte Aqua. After the rail is dry, screw in the hooks. OPTIONAL: Use the Krylon® Leafing Pen in Silver to write on containers to keep organized (ie: BATTERIES or THANK YOU NOTES).